GDPR affects the structured and unstructured data that underpins business applications. That means ERP software needs to provide native built-in features – or you risk being out of compliance with GDPR and facing stiff penalties. Identifiable customer data runs through apps. With GDPR, it’s now your responsibility to track and manage the data and determine if you have the right to use that data. 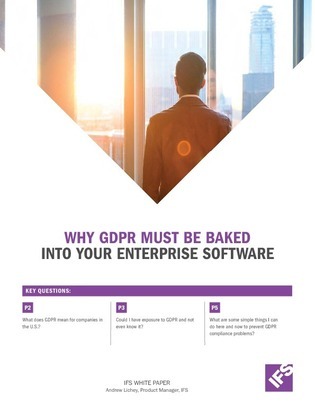 Tap into this resource to understand how a centralized ERP platform can help ease GDPR compliance. Remember, if customers call up and want their data forgotten, you want to have a quick answer and solution for them.